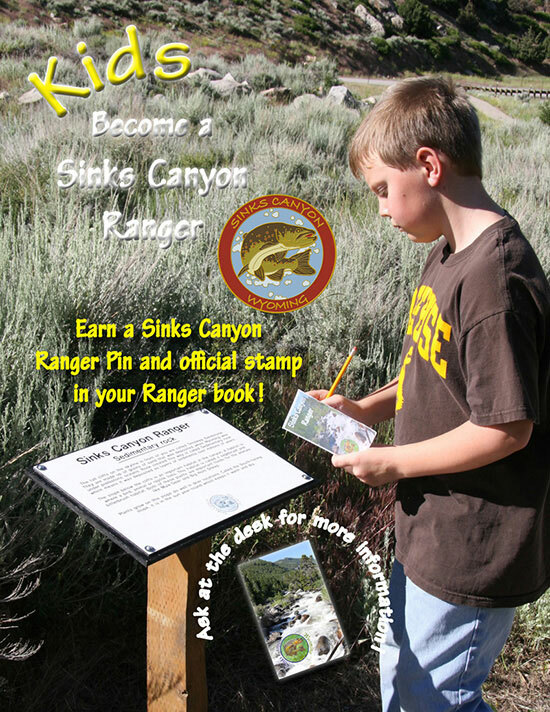 Kids that want to sign up for the Sinks Canyon Junior Ranger (recommended ages 6-12) can sign up at the Visitor Center during the summer. For a small fee they purchase a ranger booklet. If they return with the booklet filled out, they earn a Sinks Ranger badge and get their book stamped with the big red trout stamp. Kids need to answer a series of questions about the geology, history and ecology of the canyon by following a series of signs from the Sinks to the Rise. Parents are welcome to help and can learn something as well! It usually takes about half an hour to complete the book and walk from the Sinks to the Rise and back. Coming soon there will be an advanced Junior Ranger book for kids who want to spend a little more time learning about the canyon.